Carry all of your gear in style and comfort. This line of Laptop Backpacks is designed to keep you organized on the go. 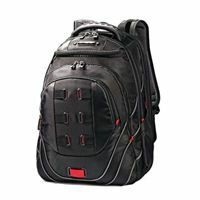 Constructed of durable ballistic fabric, each bag features comfortable padded handles and shoulder straps, co-molded zipper pulls, wide base for stability, and lots of pockets for organization. Oversized pocket for over-the-ear headphones, sunglasses, etc. Front pocket organization with Tablet/iPad pocket for all of your business needs.